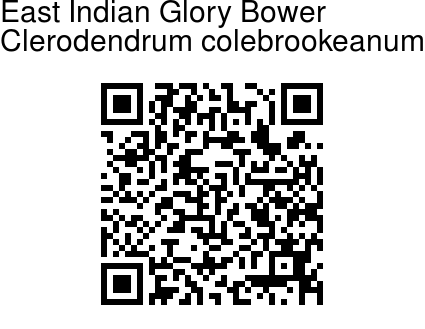 East Indian Glory Bower is a shrubs or small tree, 1.5-3 m tall. Branchlets are robust, 4-angled, densely yellow-brown puberulent when young. Leaf stalks are 2-20 cm long, carrying broadly ovate to elliptic- cordate leaves which are 7-17 cm long, 6-21 cm wide. Leaf base is wedge- shaped to heart-shaped, margin entire to slightly wavy, tip long-pointed to pointed. Flowers are borne in 4-6-branched corymbose cymes, at the end of branches. Stalk carrying the cyme is robust, 1.5-13 cm. Bracts are lanceshaped, 1.5 cm, deciduous. Sepal cup is bell-shaped, 3-5 mm, tube 1-3 mm, densely velvety, with several peltate glands. Sepals are triangular, less than 1 mm. 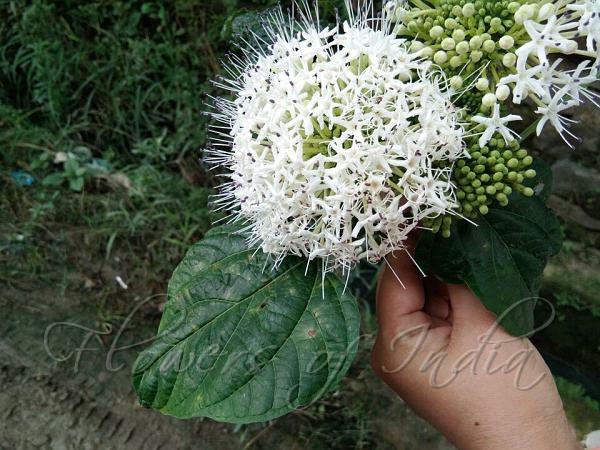 Flowers are white or rarely pinkish, with a long narrow tube 1.2-2.5 cm. Petals are oblong, 3-6 mm. Stamens and style prominently protrude out. Fruiting sepal cup is purple, inflated. Fruit is blue-green, becoming black when dry, nearly round, about 1 cm in diameter. East Indian Glory Bower is found in NE India, and parts of China and SE Asia, at altitudes of 500-2000 m. Flowering: August-December. Identification credit: Prashant Awale Photographed in Imphal, Manipur & Ailong, Mizoram.